Famous for its smooth velvety texture and unique surge and settle. This is our greatest innovation. Truly unique. Perfectly balanced. Made of More. Estd 1759. The sweetness of the malt perfectly balances the bitterness of the hops which are both beautifully complimented by the characteristic flavour of our Guinness roasted barley. Tilt the glass at 45 degrees, pour slowly, let the surge settle and enjoy. Serve extra cold. Guinness brewers were the first to introduce the combination of nitrogen and carbon dioxide to draught beer. The result was Guinness Draught, famous for its smooth velvety texture and unique surge and settle. Beer drinkers who are looking for a quality beer from a trusted brand. 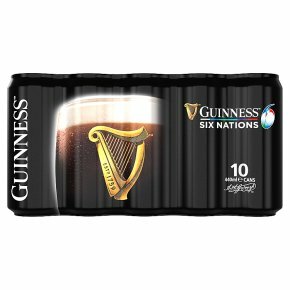 Guinness has a long history supporting rugby and took this to a new level by becoming title sponsor on the Guinness Six Nations from 2019. Tilt the glass at 45 degrees, pour slowly, let the surge settle and enjoy. Serve extra cold.